Sarah Lyons, you, and the Wasteland. 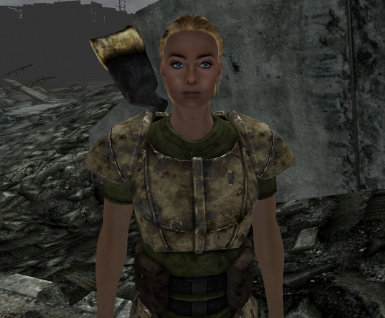 This mod adds Sarah Lyons as a recruitable companion to Fallout 3. This mod requires Broken Steel and she can be recruited only after you have completed Who Dares Wins by nuking the Enclave. 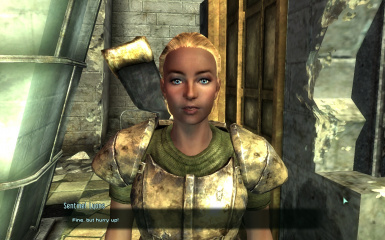 5) Go see Elder Lyons, there should be a new dialogue option: You ask if you could fight along with her daughter. 6) Elder agrees and now Sarah has a new dialogue option, use that and wham, she joins your party. Clothe her in the way you want and head out! + Automatic, no-ammo-consumption laser rifle to help her fight better. - Some may find the dialogues limited. I will fix this in further releases. This was due to her drastically limited appearances in the game. Yes, you will need BROKEN STEEL to use this mod. - Moved her Trade dialogue from bottom to up as requested. - Doubled her Rifle's fire rate and reduced spread to 0. - Added her a unique Laser Rifle. It is automatic and consumes no ammo, however it is not accessible by Player. Give her atleast 1 Microfusion cell in order for her AI to start using it. - Renamed her as Sarah Lyons, instead of Sentinel Lyons. - Increase the fire rate & damage of her rifle to help her in case a user has mods like FOOK which makes rifles like her current pathetic. - Adding new dialogues. Not related to her follower status, instead, serving RP purpose. - Possibly extending the current dialogues. Especially more "Let's go" dialogues. - Increasing the amount of dialogue and improving the already existing ones. RP-oriented dialogues will be one of the priorities of this mod with the actual Companion mission.